Almost no one wants a snake in their house, garage or yard. If you see one snake, you will most likely have several snakes around your property that are hidden. Some will be poisonous snakes. 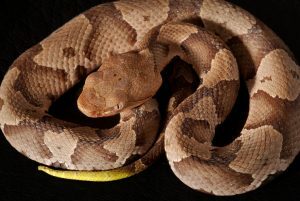 Others will not be venomous snakes, but that doesn’t mean you necessarily want them in your home or garage. For snake identification and snake removal in Atascocita Texas, contact us today. Rat snakes, copperheads, green snakes, black snakes and corral snakes abound in the Atascocita TX area. Here is some information on commonly found snakes in the Atascocita area which may need snake removal. Copperhead snakes are plentiful in the Atascocita area. These vipers are poisonous snakes, but their venom will most likely not kill a human. Still, being bitten by one of these snakes is not a pleasant experience. Unlike rattlesnakes, these snakes will not warn a person before they bite. They just bite when they feel threatened. These colorful snakes have a reddish brown hourglass pattern on their body, but not their head. They can are found in sunny spots on trees and rocks. They eat a large variety of rodents, lizards, frogs and large insects like caterpillars. They like to cool off in the water by swimming in any local water source. Then they’ll cool off under debris, buildings and in any other shady spot they can find and warrant snake removal on your property. Another commonly found type of black snake in Atascocita TX is the rat snake. This snake is not poisonous. It constricts and crushes its prey before it eats the small rodent, lizard, bird or frog. This snake is usually solid black and eats many eggs and small songbirds, which people don’t like. On the other hand, it consumes plenty of rodents, for which people are grateful. These snakes climb well and tend to find their way into garages, homes, and yards quite easily. If you don’t want snakes in yard, snakes in garage or snakes in house, contact us for advice on keeping black snakes off of your property or for snake removal. Rough green snakes are one of the many types of snakes that reside in our area. They are slender and bright green, making them easy to tell from many other types of snakes. These snakes prefer to hunt for their prey in trees and remain excellent climbers. They prefer insects, spiders, and invertebrates for food, and keep these populations down. This colorful snake is not poisonous. It can be found hiding under rocks or other types of property debris. The Texas corral snake has a colorful pattern of red and black rings separated by smaller yellow rings. These snakes live under leaves, in burrows or under logs. The Texas coral snake in Atascocita Texas eats small snakes and lizards but doesn’t care for rodents. The bite of the coral snake is poisonous, and medical treatment needs to be sought immediately. Is a snake poisonous or not? Many people don’t want to see a snake, period. If you have a snake in house, snake in garage or snake in yard, you probably have the snake’s relatives around your property, too. Contact us for safe, humane snake prevention and snake removal in the Atascocita TX area today.